There is new energy on the Belize boxing scene right now, and it bodes well for a sport that has apparently been on life support for some time now. The sporadic commercial promotions at Biltmore and Bird’s Isle are okay, but they are far too few and far between. A lot of questions have been raised about the activity level of those in charge of the sport’s top administrating body, the Belize Boxing Federation, whose president, community activist Moses Sulph, has not had a discernible impact on the plight of the sport that once enjoyed such great popularity in Belize. But there are others who refuse to give up, and their initiative has resulted in the formation of a new vehicle to try and get the boxing engine rolling. Over the past couple days, our sports desk has enjoyed visits from a few dedicated gentlemen who are putting their heads and hearts to the plough, and have already registered a new non-governmental and non-profit organization, the Belize Boxing Development Council. Henry Gill, Houston Carr, Frank Martinez and Clinton Tucker are all involved with the new organization, which is committed to “promote and obtain efficiency and harmony in the sport of boxing” in Belize. We have met Henry Gill, Frank Martinez and Clinton Tucker before in these pages, as they have on different occasions discussed their various contributions to the sport of boxing in Belize. But we first met Mr. Houston Car on Wednesday of this week and got a brief insight into his track record and concern for the sport. Carr is a retired U.S. Army veteran who returned home in 2002. Carr said he was very active in various sports during his military career, and is a certified physical fitness trainer. He served as Belize Boxing Federation president between 2004 and 2006, but resigned in frustration. He is the present Commissioner of boxing under the BBF, but is of the opinion that the present BBF president has allowed the sport to be “hijacked” by commercial promotional interests that are not taking the sport in the proper direction. Carr says it is a priority in his mind, and he has already drafted a plan, to determine the national champion in each weight class in Belize; but he needs support, and he thinks the new group of individuals share his vision and determination to make it happen. Frank Martinez, manager of the Lions Den boxing gym in San Ignacio, has been coordinating for some time with Clinton Tucker, manager of the Lions Den boxing gym in Ladyvillle, and they are active participants in a big upcoming boxing exhibition in San Ignacio featuring boxers from their gyms and others across the country. Martinez insists that we must focus on youth development to take the sport forward. He is the catalyst to the launching of the Belize Boxing Development Council, and believes that success can only be realized if there is a “body of like-minded and conscientious people” working together. And his focus is clear: “Development starts from our most fundamental resources – the children.” His plan is to have the event be FREE in an open setting where the residents of the area can all come and get initiated into an appreciation for the sport of boxing. The Boxing Tournament will be held at the Cayo Welcome Center on Saturday, October 12. The Belize Boxing Development Council has received the support of the San Ignacio/Santa Elena Town council in seeking contributions from the business people and other members of the community to make the event a success. 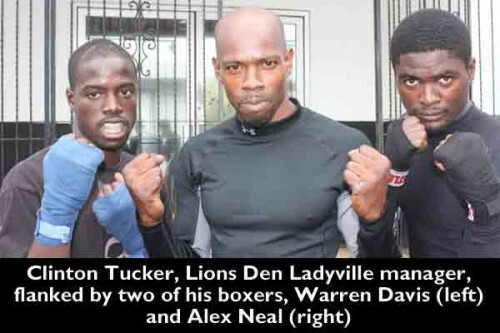 23-year-old lightweight Warren Davis will be making his debut out of Lions Den Gym of Ladyville, while his 23-yar-old stable-mate, welterweight Alex Neal (5-2) will be making his eighth appearance in the ring. Other Ladyville Lions Den fighters will be super-middleweight Oren Velasquez and light heavyweight Kenyon Wright.